Store owners who re-purpose make the case that not only are their goods more affordable, they’re also better quality. “If you buy furniture from a big box store, you will pay four times as much for a piece that we bought and reconditioned,” Kennell said. Kennell said that mass production of furniture has led to a decrease in quality, with many new items made from medium density fiberboard instead of wood. Quality vintage furniture can be found in a variety of woods like mahogany, oak and pine, and include craftsmanship like dovetail corners. “The attention to detail was just so much different,” said Jennifer Kovach, owner of The Painted House in East Aurora. “I think vintage furniture is appealing because it reflects a time gone by.” When shopping for pieces to upcycle for her store, she is drawn to mid-century modern furniture; pieces from the 1920s; and anything “Duncan Phyfe,” a style of furniture from the turn of the 20th century. Both shops offer pieces that are repaired, repainted and/or refinished; they range from less than $100 for a small table to over $500 for larger statement pieces. “It all depends on the size and what was done to restore the piece. I try to find pieces that have good storage and can give the end user a lot of value,” Kovach said. Furniture consignment shops offer great selections from every decade and for every budget. When searching, Kennell said it’s important to make sure that drawers and doors function properly, and to test the piece to see if it wobbles. Kovach cautions that antique dressers can come with small drawers — years ago people didn’t have as much clothing — but dressers don’t always have to be placed in a bedroom. They can be repurposed in dining rooms to store serving platters and other bulky serving pieces, or in mudrooms to organize gloves, hats and scarves. If you’re hunting for pieces to refurbish yourself, Kovach recommends following personal taste rather than the latest trend. Consignment and vintage furniture shops abound in WNY. Many have a distinctive niche, like Pfol’s Furniture Den in Williamsville, a higher-end store with a huge inventory. Located in Georgetown Square shopping plaza in Williamsville, this consignment shop features high-end items and a huge inventory. In addition to furniture, the store sells gently used lamps, rugs, art and other home decor essentials. For the shopper who loves to find a diamond in the rough, this Hamburg store, located at 5999 South Park Ave., is packed with furniture on consignment. The longer a piece has been in the store, the more affordable it is — pieces that hang around are discounted every month. There’s furniture from every time period, and inventory rotates on a regular basis. Located at 41 Main Street in Akron, this wallet-friendly consignment shop is worth the drive. Plus, only pre-1970s decor items are accepted, so you don’t have to weed through the ‘80s stuff to find the classics. 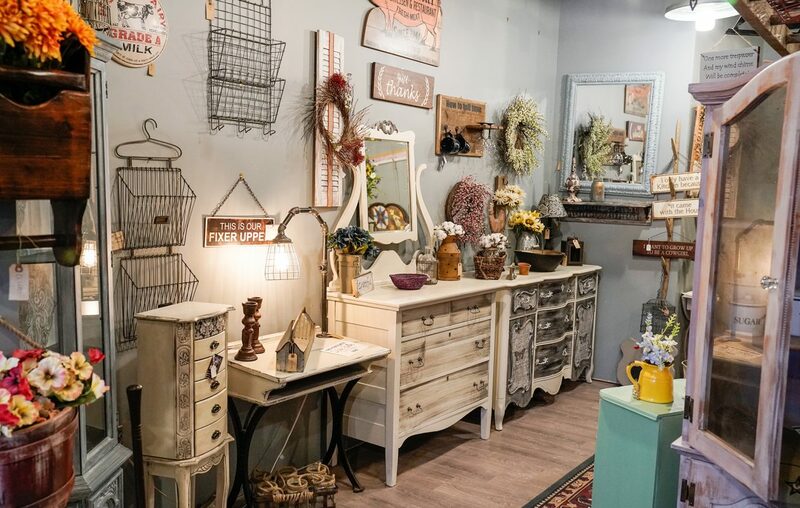 This boutique-y shop at 576 Main Street in East Aurora features a curated collection of upcycled furniture refurbished by store owner Jennifer Kovach. With her studio in the back of the store, the shop doubles as a retail and work space. Store owner Donna Kennell refinishes, refurbishes and repurposes furniture, and Kennell and fiancé Greg Jordan also take custom orders; one of their more popular items is turning antique headboards into benches. Located in Elma at 5950 Seneca Street, the store also has an active Facebook page.